Wait, Remember The Clippers New Logo? It has been a little under a month since Clippers owner Steve Ballmer unveiled the team’s new logo to a less than stellar public reaction. After the team’s 2nd round collapse, Ballmer was hoping to energize a fan base while also moving forward with the rest of NBA’s new trend of simplistic uniform designs. Unfortunately, that design has led some to question why it happened in the first place. A USA Today poll shows that 9,245 people (73.59%) gave a vote of ‘No’ when asked whether or not they liked the redesign. Even Ballmer can’t hide his look of regret. In a stroke of luck, however, the logo, which looks like it garnered a C+ for effort in an intro to Photoshop class, was greatly overshadowed by the recent DeAndre Jordan controversy. But because of Jordan’s front-page decision to ignore a not-to-be-named Dallas Maverick’s owner, the public never truly got a chance to potentially change the nature of the Clipper’s logo. After all, there were different designs all over the Internet that could have worked much better. 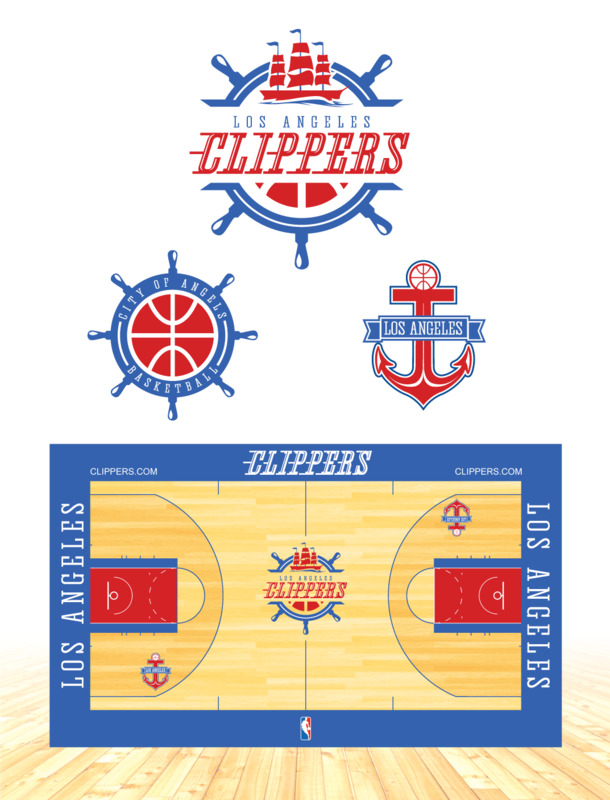 For instance, in 2011 San Francisco based graphic designer Michael Weinstein drew up a logo that played into the Clipper’s nautical theme while still maintaining a clean look overall. To add on to that, Reddit user R_E_D_D_I_T made a redesign of his own which included not only a logo, but also a proposal for a full court redesign which can be found here. Like Weinstein’s design this one was also released far before the new logo was most likely even thought up. Look at that! LOOK AT IT! How do you not go nautical?! So, my question to readers is this: why not let the people decide? What better way to re-energize a fan-base that has been disappointed by their team’s postseason losses and free agency fiascos than to re-introduce the idea of a logo change that can be voted on? Perhaps the citizens of Clipperland will want a logo that actually shows what a clipper is. According to dictionary.com, a clipper is, “a sailing ship built and rigged for speed.” So, let’s open up those sails, and checkbooks, and give the Clippers a new logo that they can actually be thankful for.